For my Moffat genealogy club members, at Thursday’s meeting, I mentioned a small book that I find particularly helpful when I’m doing genealogy work. 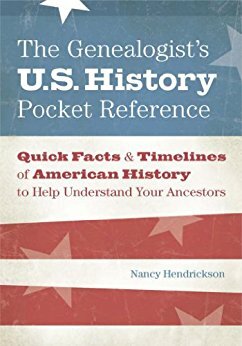 The book is called The Genealogist’s U.S. History Pocket Reference: Quick Facts & Timelines of American History to Help Understand Your Ancestors by Nancy Hendrickson. I hate to say that even as a history major, I’m absolutely terrible about remembering dates. This book is so handy and amazing to have on your desk for quick look-ups. When I’m researching an ancestor, I don’t just want to know their birth and death dates. It’s all the stuff in between that’s interesting, right?